Symptoms of peach leaf curl include puckered leaves, distorted leaf blades that turn light green fading into pink or red, along with defoliation. The leaves become puckered, distorted leaf blades turn light green fading into pink or red. Defoliation can be severe if the weather is conducive, and ultimately peach production will be reduced. Note this pathogen infects mainly the leaves and would only move to the fruit, when the disease is severe, and management tactics have not been in place. 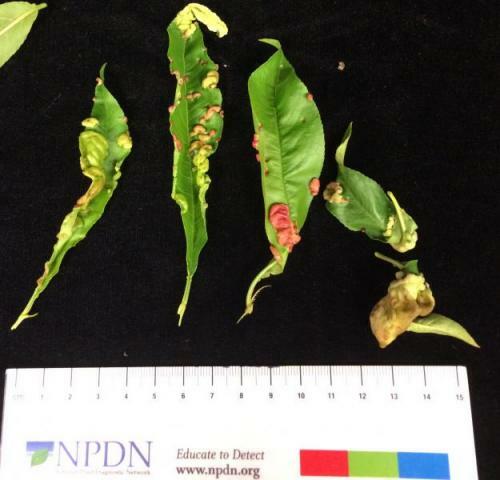 this disease can occur in the single trees or orchards. When affected, fruit can be enlarged, puckered or have scabby lesions. Peach leaf curl is caused by the fungus Taphrina deformans. 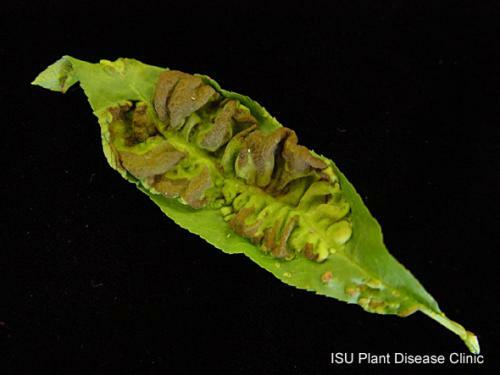 This pathogen is we plant doctors called monocyclic, meaning these fungal spores infect peach leaves only once a year in the spring. Taphrina deformans survive winter on buds or twigs of the tree. Peach leaf curl can be controlled with a single fungicide spray, but timing is critical. Fungicide application is most effective when the tree is dormant, in the fall after leaves fall or in the spring before buds swell. Some of the fungicides registered for control of leaf curl include liquid lime-sulfur, chlorothalonil, and copper products. Recommended fungicides for commercial production can be found at the most up to date Midwest Fruit Pest Management Guide.